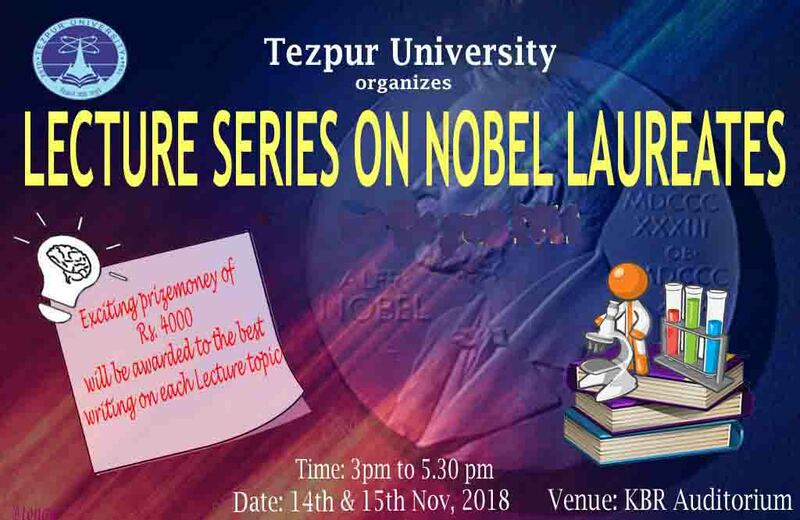 Tezpur University of Assam is going to hold a two-day lecture series programme on Nobel laureates at Kalaguru Bishnuprasad Rabha (KBR) Auditorium on Wednesday and Thursday respectively. The lecture series will be held from 3 pm to 5:30 pm on both the days. The series will feature educational and inspirational works of many renowned Nobel laureates in history. The university has invited everyone to witness the lecture of the participants at the programme. An exciting cash prize of Rs 4000 will be awarded to the best writing on each lecture topic. The programme is sure to enrich the audience and the participants with rich knowledge on the works of the Nobel laureates . It will also impress and inspire them with the struggle of each the Nobel laureates that made them achieve huge success.